Welding, which essentially is a way of heating metals using flame or electricity to bond them together, finds numerous applications across several industries. Among various metals that are used for different welding purposes, alloys of nickel are fairly common. And the market for its consumables is expanding on the back of prospering end-use industries such as building and construction, oil and gas, power, and many others. According to this business intelligence report, the demand in the global nickel alloy welding consumables market will stably increment at a CAGR of 5.4% during the forecast period of 2017 to 2025. In terms of revenue, the global nickel alloy welding consumables market is estimated to provide for opportunities worth US$5.6 bn by the end of 2025, substantially up from its evaluated valuation of US$3.5 bn in 2016. Apart from gaining traction from its flourishing end-use industries, the nickel alloy welding market is also driven by the fact that nickel is available in abundance across the world. In addition to that, the strong efficiency of the product is another benefit that stokes its demand. On the other hand, fluctuations in the overall production of the metal and the lack of skilled labors to perform diverse welding tasks are a few restraints challenging the market for nickel alloy welding consumables from attaining its true potential. Based upon product type, the nickel alloy welding consumables market has been segmented into stick electrode and wires. Stick electrodes are used in a welding process known as shielded metal arc welding. The electrode acts as filler metal as the arc process melts the core metal as well as the electrode, forming a weld pool. On the other hand, welding wires are used in various arc welding processes such as gas metal arc welding (GMAW), gas tungsten arc welding (GTAW), flux cored metal arc welding (FCAW), and submerged arc welding (SAW). In 2016, the welding wires segment accounted for the most prominent chunk of demand in the nickel alloy welding consumables market. The greater precision and deposition efficiency provided by wires as compared to electrodes has helped the nickel-alloy-based wire segment to gain additional market share. On the basis of alloy type, the market has been classified into Monel and Inconel, whereas technology-wise, the market has been bifurcated into gas metal arc welding, shielded metal arc welding, gas tungsten arc welding, submerged arc welding, and flux cored arc welding. Application-wise, the report detects the potential of demand that can be expected out of end-use industries of oil and gas, construction, power, marine, manufacturing, and transportation. Geographically, the demand for nickel alloy welding consumables is highest in Asia Pacific. The region accounted for a demand share of 33.8% in 2017 and is anticipated to reach up to 35.7% by the end of 2025. Asia Pacific is expected to remain the major region of the nickel alloy welding consumables market due to the presence of emerging economies such as China and India that are vastly populated. On the other hand, North America and Europe are mature regions of the nickel alloy welding consumables. However, countries such as Canada, the U.K., and Germany are anticipated to provide significant growth prospects over the course of the forecast period. Middle East & Africa and Latin America held low share of the nickel alloy welding consumables market in 2016. Demand for nickel alloy welding consumables in Latin America is likely to decrease, while that from the Middle East & Africa is projected to rise at a constant rate in the near future. Lincoln Electric Holdings Inc., Colfax Corporation, ESAB, Illinois Tool Works Inc., and Voestalpine Böhler Welding GmbH are a few key players holding a position of strength in the global nickel alloy welding consumables market. Welding consumables are the filler metals or materials that are consumed during the course of welding. Welding consumables are basically available as stick electrode or wires. The products are primarily used for application in the power, automobiles & transportation, building & construction, marine, and oil & gas industries. Nickel alloy welding consumables are manufactured using nickel alloy as one of the major raw material. The product is highly in demand due to abundant availability of the product type and product efficiency. The report estimates and forecasts the market on the global, regional, and country levels. The study provides forecast between 2017 and 2025 based on volume (Kilo Tons) and revenue (US$ Mn) with 2016 as the base year. The report comprises an exhaustive value chain analysis for each of the product segments. It provides a comprehensive view of the market. Value chain analysis also offers detailed information about value addition at each stage. 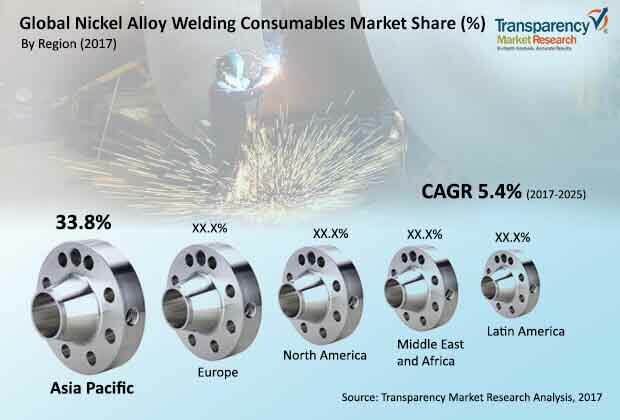 The study includes drivers and restraints for the nickel alloy welding consumables market along with their impact on demand during the forecast period. The study also provides key market indicators affecting the growth of the market. The report analyzes opportunities in the nickel alloy welding consumables market on the global and regional level. Drivers, restraints, and opportunities mentioned in the report are justified through quantitative and qualitative data. These have been verified through primary and secondary resources. The report includes Porter’s Five Forces Model to determine the degree of competition in the nickel alloy welding consumables market. The report comprises a qualitative write-up on market attractiveness analysis, wherein application type and countries have been analyzed based on attractiveness for each region. Growth rate, market size, raw material availability, profit margin, impact strength, technology, competition, and other factors (such as environmental and legal) have been evaluated in order to derive the general attractiveness of the market. The report comprises price trend analysis for nickel alloy welding consumables between 2017 and 2025. The study provides a comprehensive view of the nickel alloy welding consumables market by dividing it on the basis of application and geography segments. The nickel alloy welding consumables market has been segmented into oil & gas, power, construction, marine and others based on application type. Application type segment have been analyzed based on historic, present, and future trends. Regional segmentation includes the current and forecast demand for nickel alloy welding consumables in North America, Europe, Asia Pacific, Latin America, and Middle East & Africa (MEA). Additionally, the report comprises country-level analysis in terms of volume and revenue for various segments. Key countries such as the U.S., Canada, Germany, France, the U.K., Spain, Italy, India, China, Japan, South Africa, Mexico, and Brazil have been included in the study. Market segmentation includes demand for individual application type in all the regions and countries. The report covers detailed competitive outlook that includes market share and profiles of key players operating in the global market. Key players profiled in the report includes Colfax Corporation, Lincoln Electric Holdings Inc., Illinois Tool Works Inc., and others. Company profiles include attributes such as company overview, number of employees, brand overview, key competitors, business overview, business strategies, recent/key developments, acquisitions, and financial overview (wherever applicable).